While the U.S beats Singapore on the latest global competitiveness index by the World Economic Forum, it is only about 16 points away from the frontier mark of 100. 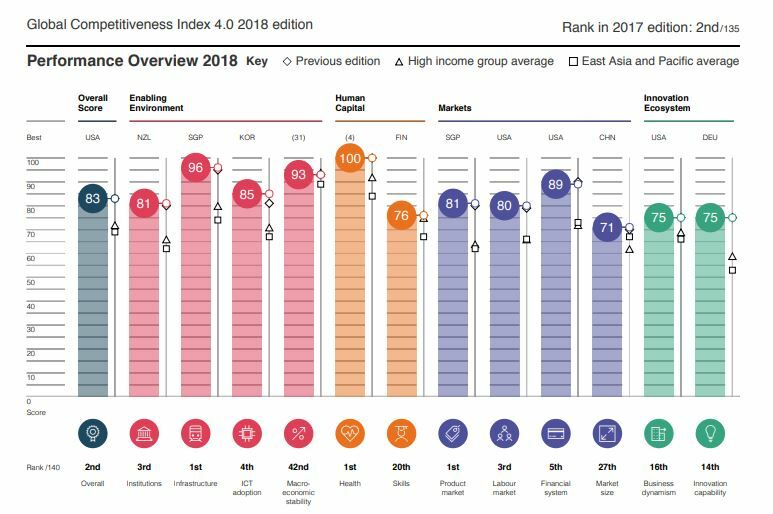 The new Global Competitiveness Index 4.0 (GCI 4.0) by the World Economic Forum measures national competitiveness, defined as the set of institutions, policies and factors that determine the level of productivity and ranks 140 countries based on these parameters. The United States leads the rankings with a score of 85.6, followed by Singapore with a score of 83.5. Singapore’s high score can be attributed to a strong Infrastructure pillar in which it has got a near-perfect score of 95.7. The score highlights world-class transport infrastructure, services and connectivity. It also tops the Product market pillar (81.2), where it leads the trade openness component. With a healthy life expectancy of 74 years, it also achieves a perfect makes a good mark in the Health pillar. Interestingly, it lies ahead of Japan under the health pillar. Not only Singapore, but the report also paints a mostly positive picture of the entire East Asia region’s competitive landscape. The region’s seven advanced economies all feature in the top 20 of the GCI 4.0 rankings and three of the world’s seven most competitive economies—Singapore (83.5, 2nd), Japan (82.5, 5th) and Hong Kong SAR (82.3, 7th)—stem from the region. However, one of the reports most concerning findings is the relative weakness across the board when it comes to mastering the innovation process, from idea generation to product commercialization. Here, 103 countries score lower than 50 in this area of the index which is topped by Germany, followed by the United States and Switzerland. While most economies struggle with the innovation index, the region’s innovation hubs—Japan, Korea, and Taiwan (China)—could improve on the so-called ‘softer’ drivers of innovation to attain the level of “super innovators” such as Germany, the United States and Switzerland. Even for Singapore, the three areas where it scored below 80 include Skills (76.0, 20th), Business dynamism (74.7, 16th) and Innovation capability (75.0, 14th). It also scored low in terms of market size (71.0, 27th globally). Further, Malaysia (74.4, 25th) and China (72.6, 28th) are less than 30 points to the competitiveness frontier (the highest score on the GCI) and on par with many advanced economies. With a gain of two places and 1.4 points compared with the 2017 backcast edition, Indonesia ranks 45th overall (64.9). The report acknowledges that with the Fourth Industrial Revolution (4IR), humanity has entered a new phase. Klaus Schwab, Founder and Executive Chairman, World Economic Forum, says "Embracing the Fourth Industrial Revolution has become a defining factor for competitiveness." 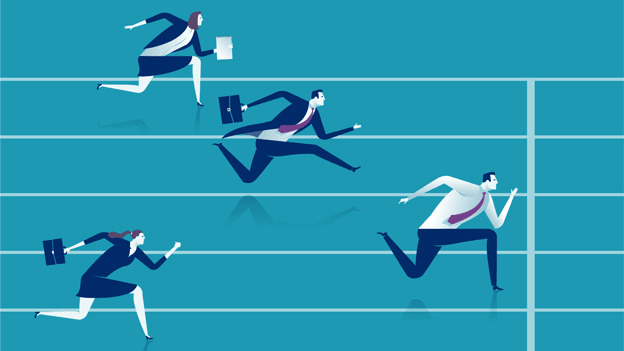 However, "Competitiveness is neither a competition nor a zero-sum game," adds Saadia Zahidi, Member of the Managing Board and Head of the Centre for the New Economy and Society. The good news is that in spite of the many drawbacks highlighted in the report, all countries have the capability to become more prosperous. The one unifying theme among the world’s most competitive economies is that they all possess considerable room for improvement. But what will be critical is the investment in people and institutions. "With opportunities for economic leapfrogging, diffusion of innovative ideas across borders and new forms of value creation, the Fourth Industrial Revolution can level the playing field for all economies. But technology is not a silver bullet on its own. Countries must invest in people and institutions to deliver on the promise of technology.” said Saadia Zahidi.